This week was kinda tough thanks to the long weekend. 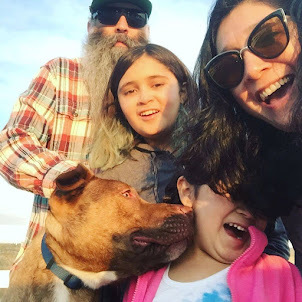 We managed to get everything done! "Louie's doll landing there was a total fluke. I was stunned and stared at it with my mouth gaped and I muttered to myself 'legendary'." Math: Ugh! I am so scared that math is going to be a complete nightmare this year. This week we reviewed rounding and using tables and graphs to answer questions. It sometimes feel like we are teaching her the concept all over again. It seems like there was little to no retention. It did not help that Math was given to us a day late so we had to squeeze on all 11 pages in 2 sessions. With math the more spaced out the better. I have also found that she really needs undivided attention when working on math, but at the same time she gets so frustrated when I have to explain the same things over and over. It is a battle this damn math. Her teacher will be offering tutoring time on Fridays and I think starting this Friday we will have her stay for 30 minutes just to work on math. 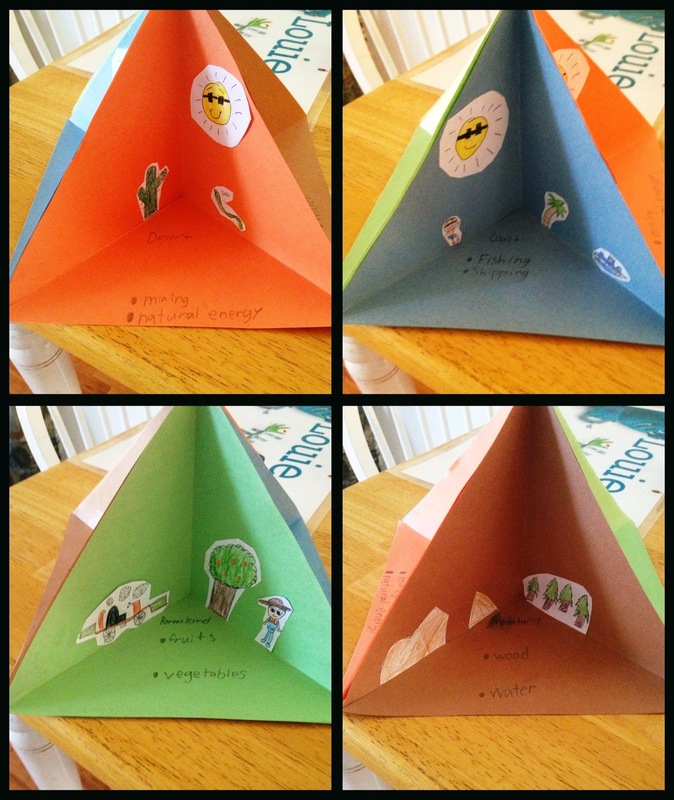 For this lesson we took a stab at our first triangle diorama. Phi made a triangle section for each region and listed 2 different things we get from each region. Here is her final product. You can tell with this project that we were rushed for the week. She hit all the requirements but this project could have been a lot more fun and creative. Science: Last week was all about consumers and producers and this week we talked all about decomposers. Well of course we didn't just talk about them. Phi answered the questions from her worksheets. 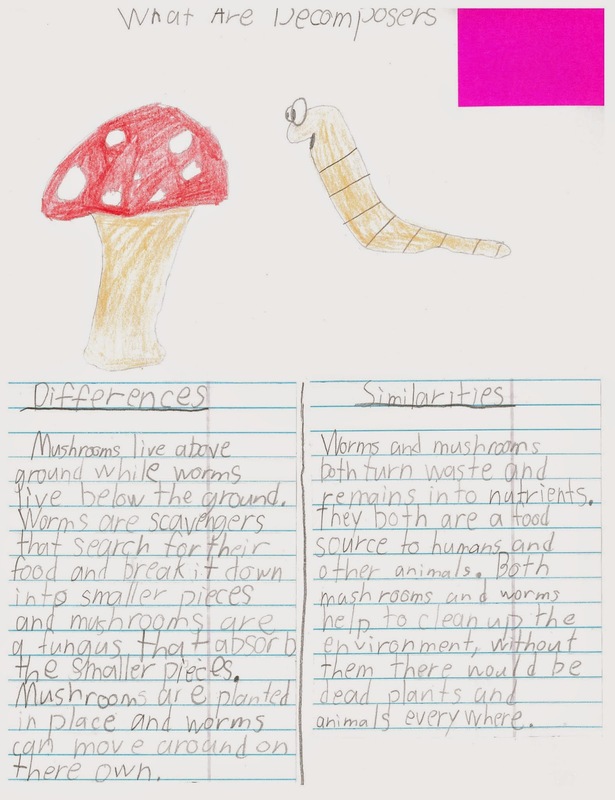 A second assignment was to compare and contrast 2 different decomposers. She chose mushrooms and earthworms. How stinking cute is her worm! We also decided to take this lesson a step further and Phi and Poppa went on a mission to find live worms. Lo and behold Wal-Mart had them. 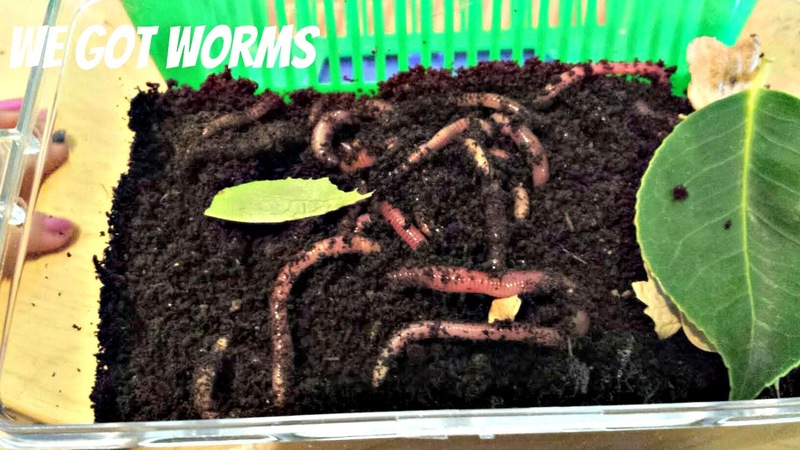 Yesterday Phi and Poppa made a worm farm with newspaper, soil, worms and leaves. Now we get to see these guys do the decomposing thing that they do. Oi, those worms. I loathe worms. That's still cool that you built a worm farm. I think it's awesome that Phi used almost all of her words in one sentence, and correctly too! Win! I am not a huge fan of those worms either. Notice it was Phi and POPPA who did that project! So glad to hear I am not alone in struggling with math. When we did multiplication last year it was so difficult. I used every trick I could find and what finally worked for her was picture association. For example "door times sign equals dirty sticks. (4X9=36) The website multiplication.com (http://www.multiplication.com/learn/learn-fact/9/x/9) and there was a short story that helps them remember.